A door-to-door information campaign in Turkey unintentionally polarised the electorate over their vote in a policy referendum. The degree to which citizens are informed and have accurate beliefs affects the functioning of democracies. Numerous studies have shown that with more access to information, through channels such as higher newspaper circulation and radio penetration, citizens are more likely to hold politicians accountable (Drèze and Sen 1989, Besley and Burgess 2002, Ferraz and Finan 2008; Snyder and Strömberg, 2010). Similarly, other studies have found that direct communication on policy outcomes, like information campaigns or debates, can also increase political accountability or lead citizens to have more accurate beliefs on the position of politicians (Banerjee et al. 2011, Kendall et al. 2015, Bidwell et al. 2016). On the other hand, increased access to information is also believed to polarise voters (Gentzkow and Shapiro 2011, Sunstein 2001). Among the various factors that can drive polarisation, there are theoretical studies and lab experiments showing that voter disagreement can increase and even persist in response to the same signal; for example, this can be the result of of voter bias or differences in beliefs about the state of the world and uncertainty over the source of the information. In the context of Turkey, I provide some of the first experimental field evidence showing that exposure to the same door-to-door information campaign polarised the average policy choice across voters (Baysan 2018). The campaign took place before a landmark referendum that was initiated by the incumbent party in Turkey after the chaotic coup attempt in July 2016. The referendum was on institutional changes to weaken constraints on the executive branch in Turkey. The campaign was implemented by individuals from the main opposition party and therefore reflected their strategy to contest for votes. From their perspective, a door-to-door campaign was a channel by which they could bypass high media censorship and directly give information on policy outcomes to voters. There is not much evidence on the effectiveness of actual partisan campaigns in countries like Turkey, which is considered an illiberal democracy and, at the time of this study, had a governance ranking lower than that of Pakistan, Bangladesh, and Kenya. Studies that have evaluated partisan campaigns have been concentrated in liberal democracies, despite the fact that illiberal democracies are one of the most common forms of governance today. Although individuals from the main opposition party implemented the campaign, I had the opportunity to design its implementation. This entailed randomly selecting neighbourhoods for the party volunteers to visit (treatment group) and neighbourhoods that would not be targeted by the campaign (control group). Randomisation was at the neighbourhood level because this is the level at which administrative vote share and turnout data is publicly available for elections. In addition, prior to the randomisation, neighbourhoods were grouped by quartiles of the difference in vote share between the incumbent and opposition party in previous elections. This method made it possible to test the effect of the campaign by average partisanship. The opposition party’s strategy in this campaign was to give voters information on poor economic performance and increased terrorist activity under the incumbent party. Voters were also told to choose “No” in the referendum, i.e. to oppose weakening constraints on the incumbent. As shown in figure 1, I find that in moderate areas (areas where the vote share differential between the two parties has been low in recent elections. These are also areas where the predicted share of moderate voters is high) where the opposition was stronger, the information increased the “No” vote share by 1.8 percentage points (2.6%). In moderate areas where the opposition was weaker, the information decreased the “No” vote share by 3.7 percentage points (5.9%). As a result of this variation in impact, the net effect of the campaign was zero. The study also provides suggestive evidence that the observed polarisation is unlikely to be due to mobilisation, given that in each quartile, the treatment effect on turnout is close to zero. Note: The figure illustrates the effect of the campaign on voting behavior. The x-axis is the difference in neighbourhood-level vote share between the opposition and the incumbent in the 2015 general elections. The y-axis is the outcome, which is the share that voted “No” at the neighbourhood level in the referendum. What is driving the polarisation? 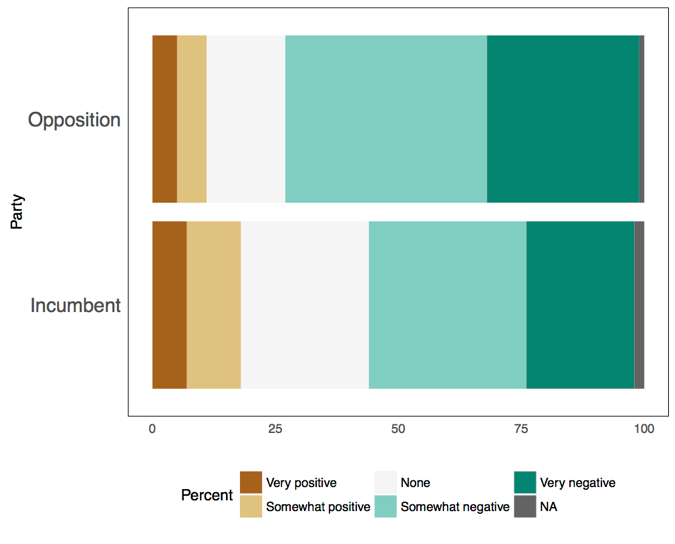 As shown in figure 2a below, a nationally-representative survey conducted after the coup attempt and before the referendum found that supporters of the incumbent and opposition voters agreed that they had been negatively affected by the severe drop in the value of Turkish Lira. 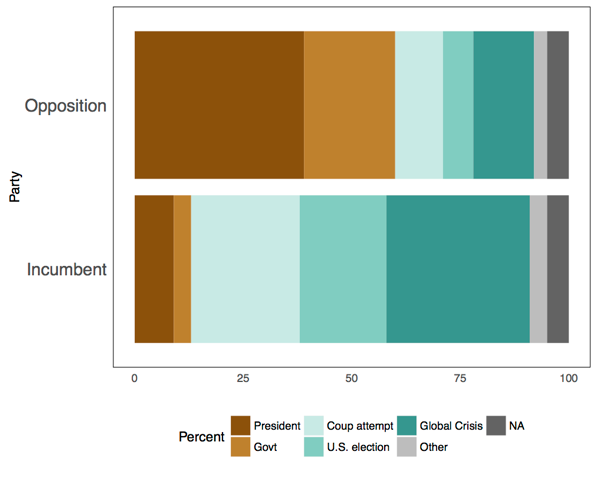 However, as illustrated in figure 2b, self-reported supporters of the incumbent attributed poor conditions to factors they believed to be outside the leadership’s control; such as, the attempted coup, the U.S. elections, and the global recession. Opposition supporters instead blamed the incumbent party. In this example, when there are different beliefs on why conditions are bad, a negative signal about the economy can shift voters to have either higher or lower support for the incumbent. This can lead to polarisation, as observed at the aggregate level. Does the drop in the value of Turkish Lira have any impact on your personal life? Who is to blame for the drop in the value of the Lira? Another possibility is that voters were reacting to the fact that the campaign affected their view of how strong the opposition is. In this case, in areas where the incumbent (opposition) previously had higher support, incumbent (opposition) voters may have urgently pressured the vote of moderate voters. While only suggestive, the study includes some evidence to rule out this possibility. In 20% of the neighbourhoods allocated to be treated by the campaign, the canvassers had to pull out of the neighbourhoods because they faced aggression and threats. If the result was driven by reactions to opposition strength, we may have expected that the threat, or the share of people that the canvassers were able to speak to, was correlated with partisanship, although this was not the case. Ideally, the study would have included an individual level survey to corroborate the neighbourhood level results. However, it is difficult to implement costly surveys in politically sensitive areas, especially close to an election and during a state of emergency. Further research is required to pinpoint the mechanism driving the polarisation in this study. A lot of money is invested in partisan campaigns by political elites. 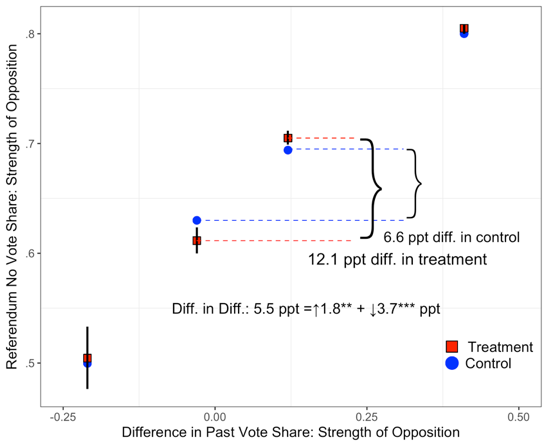 While partisan campaign experiments in the U.S. have been effective in changing turnout, they have generally been ineffective in changing vote share (Kalla and Broockman, 2017). However, most of these experiments did not pre-specify testing for variation in the direction in which the campaign affected different groups of voters (heterogeneous effects) and most of them rely on self-reported voting behaviour. Either of these factors could contribute to the studies to not reject a null hypothesis of no effect. In summary, we learn that the same campaign increased polarisation over an important policy choice on average, and particularly in areas where moderate voters are concentrated. This makes it tricky to identify and target swing voters who will change their vote in the favorable direction. Political elites from the opposition party in this context did not have sophisticated voter data required to target the right voters and increase their vote share. Finally, we also observe that in response to the same campaign, voters made different choices to weaken the system of checks and balances, a monumental institutional change. Acemoglu, D, J A Robinson and R Torvik (2013), “Why do voters dismantle checks and balances?”, Review of Economic Studies 80(3):845–875. Andreoni, J and T Mylovanov (2012), “Diverging opinions”, American Economic Journal: Microeconomics 4(1): 209-32. Banerjee, A, S Kumar, R Pande and F Su (2010), “Do informed voters make better choices? Experimental evidence from urban India”, Unpublished manuscript. Baysan, C (2018), “Can more information lead to more voter polarisation? Experimental evidence from Turkey”, UC Berkeley Job Market Paper. Benoit, J-P and J Dubra (2016), “A theory of rational attitude polarisation”, Working Paper. Besley, T and R Burgess (2002), “The political economy of government responsiveness: Theory and evidence from India”, The Quarterly Journal of Economics 117(4):1415–1451. Bidwell, K, K Casey and R Glennerster (2016), “Voting and expenditure responses to political communication”, Working Paper. DellaVigna, S and M Gentzkow (2010), “Persuasion: Empirical evidence”, Annual Review of Economics 2(1):643–69. Dixit, A K and J W Weibull (2007), “Political polarisation”, PNAS 104(18):7351–7356. Drèze, J and A Sen (1989), Hunger and public action, Oxford: Clarendon Press. Ferraz, C and F Finan (2008), “Exposing corrupt politicians: The effect of Brazil’s publicly released audits on electoral outcomes”, The Quarterly Journal of Economics 123(2):703– 745. Fryer, R G, P Harms and M O Jackson (2017), “Updating beliefs when evidence is open to interpretation: Implications for bias and polarisation”, Working Paper. Gentzkow, M and J M Shapiro (2011), “Ideological segregation online and offline”, The Quarterly Journal of Economics 126(4):1799–1839. Jenkins, G. (2016). “Turkey’s proposed constitutional changes and Erdoğan’s forever war”, The Turkey Analyst. Kalla, J L and D E Broockman (2018), “The minimal persuasive effects of campaign contact in general elections: Evidence from 49 field experiments”, American Political Science Review 112(1): 148-166. Kendall, C, T Nannicini and F Trebbi (2015), “How do voters respond to information? Evidence from a randomized campaign”, American Economic Review 105(1):322–353. Loh, I and G Phelan (2017), “Dimensionality and disagreement: Asymptotic belief divergence in response to common information”, Working Paper. Lord, C G, L Ross and M R Lepper (1979), “Biased assimilation and attitude polarization: The effects of prior theories on subsequently considered evidence”, Journal of Personality and Social Psychology 37(11):2098–2109. Snyder, J. M., and Strömberg, D. (2010), “Press coverage and political accountability”, Journal of Political Economy, 118(2): 355-408. Sunstein, C R (2001), Republic.Com, Princeton University Press, Princeton, NJ, USA. Kalla and Broockman (2017) conduct a meta-analysis of campaign experiments in the U.S. and find that they are ineffective. In Europe, Pons (2017) and Kendall et al. (2015) find that that campaigns significantly affected vote share in France and Italy. For example, DellaVigna and Kaplan (2007) show that biased media changed voting behaviour in the U.S. and with easier access to information, voters may self-segregate ideologically into different sources of information leading to divergent beliefs (Gentzkow and Shapiro, 2011). Most of this literature is theoretical; see Dixit and Weibull (2007); Andreoni and Mylovanov (2012); Acemoglu et al. (2016); Loh and Phelan (2017); Benoit and Dubra (2016); Piketty, (1995). There are also lab experiments in the psychology literature, such as the study by Lord et al. (1979), as well as the economics literature – Andreoni and Mylovanov (2012). Fryer et al. (2017) provide evidence using an online experiment. The referendum was on switching from a parliamentary system to a presidential system and on eighteen amendments to the constitution. A number of the proposed amendments to the constitution would consolidate power under the president. For example, a new power granted to the president is the ability to bypass the parliament completely and introduce legislation by issuing decrees with the force of law (Jenkins, 2016). 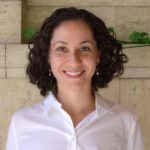 Ceren Baysan is a Ph.D. student at University of California, Berkeley. You can read her job market paper here. An earlier version of this blog post was published on the World Bank’s Development Impact Blog.